I learned about South Bay Children’s Health Center at a local library health fair. My husband and I work hard to make ends meet and we have never been able to afford dental insurance. The staff from SBCHC explained that they had a grant that could help pay for my children’s care, which made our payments really affordable. We booked the appointments and five years later, we still bring our family there for dental care. This office is so remarkable; I wish every child could come here. The staff is understanding, very compassionate and personable and the clinic is beautiful. Today, with raising nine kids, we still struggle to make ends meet, yet we know when we go to the clinic, we’re home! This year, we even got an amazing gift basket from one of the organizations that support them and we were really overwhelmed with joy. I used to have a strange, but strong fear of going to the dentist. One day we were referred to SBCHC. I was so frightened that my grandmother bribed me to go. And I must say, that referral was a blessing in disguise. Everyone in the office is always extremely friendly and welcoming. Dr. Sata, seems to be one of the most sincere people I have met, as well as extremely concerned with her patients’ well-being. She goes through efforts to make sure that I am comfortable and will assure me that everything is going to not just be all right, but the best possible. She fixed up all of my teeth and restored them to great condition and helped me overcome my fear of the dentist. My brother and I feel so privileged to be coming to SBCHC. Dr. Sata and the staff have impacted our lives tremendously in an extremely positive way. I see improvement in my child’s life. My son is calmer and he has learned how to control himself and follow rules. I could not go through such a great relief for my son’s dental needs without expressing my gratitude to you all. Through your skilled and compassionate care, I have tackled a fear that has always scared my son as he is a shy person. Before I began treatment at your office, I worried endlessly about his teeth and his smile. Now I can see him confidently deal with those issues. Thank you all for your kind and excellent care. I am sure that you will find yourself with at least a couple of new patients because of me, I tell all of my family and friends what a wonderful dentist, with a really great staff, I’ve found! All the best. I am a 27 year old mother of three. I am also an addict. I started my journey going to detox back in July of 2010. After detox, I transferred to an inpatient facility. I was there for 3 ½ months. I decided to leave there and go to an outpatient treatment program called Options for Recovery. I have been here since October 2010. One morning, I woke up with a really bad toothache. I went to treatment and told the Director that I was in severe pain. She told me to hold on while she made a few phone calls in hopes of getting me help. I had no insurance and I thought my only option was to ask my Aunt for money to see what was wrong. I knew that whatever my Aunt gave me would not cover all the work I needed. I contacted an old Dentist and made an appointment to be seen. After I arrived at that appointment the Director called me and said I needed to call Tina Harris the Director of SBCHC Dental Clinic as soon as possible. I contacted her and through their program, I have been able to receive free dental care. Due to my drug use, my teeth were neglected. The last time I had been to the Dentist prior to my treatment at SBCHC was about 5 years ago. During my first visit with Dr. Sata I learned that I needed extensive dental work. At that first visit, I was very nervous and scared. Dr. Sata and her team welcomed me with open arms. They all made me feel comfortable and explained everything to me while they did what needed to be done. It was a very comforting experience for me. Working with Dr. Sata, I was fortunate enough to meet Dr. Westernoff who committed to meet with me and provide my services free of charge. I am a mother who has a history of substance abuse and I have had lots of trauma in my life. To be given the opportunity to change some of the physical ramifications of my past is a blessing. Even the beginning stages of my dental work have improved my confidence as well as my self-esteem. Taking care of myself both physically and mentally is an important part of motherhood. I recognize that fixing some of my physical attributes will have a major impact on my future. I plan to always stay abreast of my dental needs. I am no longer stuck in addiction and I am responsible for my life today. The support I received here will not be forgotten. I am extremely grateful and appreciative to South Bay Children Health Center Dental Clinic and their team as well as Dr. Westernoff and his team. Our family lives on a modest income and I understood that without dental care, the cavities could lead to severe health problems if left untreated. But we simply didn’t have the money. Then I saw a note at the bottom that suggested that if we went to the South Bay Children’s Health Center, a fee payment schedule could be arranged that would be possible for us. We made appointments for all 5 of our children and found that the service was prompt, the office was clean, the staff was friendly, the dentists were respectful and knowledgeable and the care was high quality. After the first visit, we knew we would never go anywhere else. The standard of dental care alone is enough to bring our family back, but the compassion and respect that my family feels from the SBCHC family is what will keep my loyalty for as long as they are doing business. I cannot recommend Dr. Sata and the South Bay Children’s Health Center highly enough! Sandpipers is dedicated to serving those in need in the South Bay and are pleased to support South Bay Children’s Health Center. 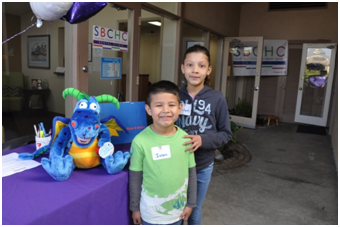 For more than 60 years Sandpipers has been able to give assistance to SBCHC dental screening program at elementary and middle schools in the area. 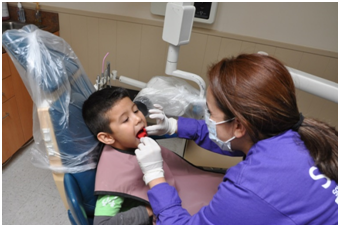 The Sandpipers volunteers are amazed at the time and energy the dentists and dental assistants put into screening the mouths of every child and then referring them to free or low cost treatment at the SBCHC Dental Clinic. 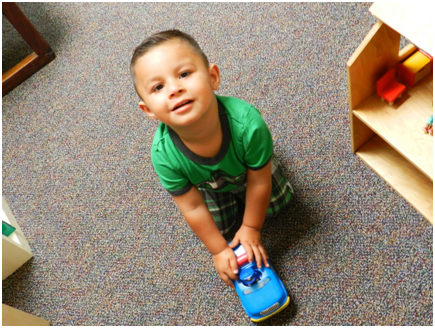 Sandpipers has also been able to provide numerous grants so SBCHC can continue the important dental and mental health care they give to lower income children in our community. We are so proud to partner with South Bay Children’s Health Center! SBCHC has been helping my family for more than 50 years. I cannot say enough about the dental clinic, the staff always takes that extra step to help us during our time of need. I am so thankful that SBCHC is here to support and care for us in the South Bay.